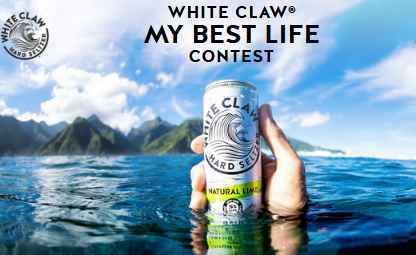 White Claw brings you the My Best Life Contest where you could receive $60,000 to be the official White Claw Hard Seltzer ‘Best Life’ ambassadors for 6 months, traveling domestically discovering new passions and experiences. How To Enter The White Claw Contest? Take a photo of yourself that visually expresses how you currently or would in the future ‘Live your best life’ if you were selected as a lucky winner of the White Claw Ambassador Package. and a caption explaining yourself how you currently or would in the future ‘Live your best life’ if you were chosen as a winner of the White Claw Ambassador Package. To ‘Live your best life’ is to live life to the fullest such as by traveling, embracing new experiences and discovering new passions etc. Online Entry. During the White Claw Contest Period, visit this website www.whiteclawbestlife.com and follow all online instructions to complete the entry form, upload the Photo, provide a Caption of up to 250 words in the indicated area of the entry form and submit. Instagram Entry: During the White Claw Contest Period, log in to your Instagram account, and then follow @whiteclaw on Instagram, and upload and share your Photo and Caption to your public Instagram account, including the hashtag #MyBestLifeContest and tag @WhiteClaw in the photo caption. make sure your uploaded photo is public. Who Can Enter: This sweepstakes is open only to legal residents of the fifty (50) United States and the District of Columbia who are twenty five (25) years of age or older at the time they enter the sweepstakes. When To Enter: The White Claw My Best Life Contest begins at 12:00:01 AM Eastern Time (“ET”) on Wednesday, May 2, 2018 and ends at 11:59:59 PM ET on Sunday, June 3, 2018. Sponsor: Mark Anthony Brands Inc., Chicago, IL 60661. Sweepstakes Prize: There are two (2) Ambassador Packages available to be won by eligible Contest entrants, one (1) for a male Finalist and one (1) for a female Finalist. Each Ambassador Package winner will be named a White Claw Ambassador for a period of up to six (6) months. Ambassador Package winner will be required to agree to and execute all agreements and contracts required to be named a White Claw Ambassador, including but not limited to a Publicity Release, Liability Release, Ambassador Agreement, and Travel Waiver. for full prize details see contest rules.